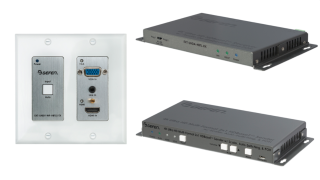 The What: Nortek Security & Control (NSC) is now shipping two new Gefen 4K Ultra HD Multi-Format 2x1 HDBaseT Senders (EXT-UHDV-WP-HBTLS-TX and EXT-UHDV-HBTLS-TX) and a 4K Ultra HD HDBaseT Receiver (EXT-UHDA-HBTL-RX). The What Else: The EXT-UHDV-WP-HBTLS-TX features a Decora wall plate form factor that can be installed in walls and blend well with the décor of a venue. The EXT-UHDV-HBTLS-TX is a high-performance solution in a compact enclosure that can be surface mounted or placed on a shelf. Both senders can accept 4K Ultra HD HDMI and VGA sources and extend them up to 70 meters (230 feet) at 1080p and 40 meters (130 feet) at 4K over a single Cat-5e cable. Switching between the HDMI and VGA can be set to automatic or be done manually via the front panel button or RS-232. The HDBaseT extension system supports 10.2Gbps of data throughput and 300MHz TMDS clock frequency. Resolution/timing can be up to 4K60 4:2:0 on the wall plate and 4K30 4:4:4 on the tabletop model. Both senders use the Gefen implementation of the HDBaseT technology with enhancements including Advanced EDID Management. Highest performance multichannel digital audio including 7.1 channels of LPCM and HBR (high bitrate) digital audio formats, such as Dolby Atmos, Dolby TrueHD, DTS:X, and DTS-HD Master Audio are passed through from the HDMI input to output. The VGA input features a companion L/R analog audio input, and accepts VESA and CEA resolutions up to WUXGA (1920x1200 to 60Hz, 4:4:4) and 1080p (1920x1080 at 60Hz, 4:4:4). The HDMI input on the EXT-UHDV-HBTLS-TX supports 18Gbps of data and 600MHz TMDS clock frequency, accepting full spec HDMI 2.0 to Ultra HD (3860x2160) and 4K Cinema-DCI (4096x2160), at 60Hz 4:4:4. A powerful built-in scaler on each sender can upscale lower resolution VGA signals with legacy aspect ratio to widescreen WUXGA, enabling smooth switching transitions between the HDMI and the VGA sources. While the wall plate sender extends bidirectional RS-232, the EXT-UHDV-HBTLS-TX extends both RS-232 and two-way IR, facilitating the control of AV sources placed near the sender from the viewing location, and sending commands from the head end to control the display or another device placed near the receiver unit. Both senders also accept RS-232 commands for switching, scaler controls, and EDID management from a third-party controller placed near the sender or remotely by the receiver. Audio volume on the EXT-UHDV-HBTLS-TX can be adjusted or muted via the front-panel buttons or RS-232 commands from a third-party controller, a very useful tool for presentations in corporate, educational, and institutional installations. Each sender features a professional API, designed to maximize control and feedback when used with third-party automation devices. The Gefen EXT-UHDA-HBTL-RX is a high-performance HDBaseT receiver that has been designed to work with these two sender units. It de-embeds analog L/R, TOSLINK optical digital, and coaxial digital audio from the video for use with a separate audio system, enhancing the impact of presentations. The standard PoH (Power over HDBaseT) technology enabled on these products can supply power remotely from the EXT-UHDA-HBTL-RX to the senders, using the same Cat-5 cable that extends the HDMI signal. The table-top sender can also power the receiver. The receiver unit features an ultra-low-profile enclosure that, thanks to its IR Extender input, can be completely hidden away behind the display and/or surface-mounted as need be. The Bottom Line: All three products have been designed to work with Gefen Syner-G software, increasing capabilities for product configuration as well as in-field firmware updates.